One of those days, where you are searching for something and you go through everything, and still can't find it??? And then you try to think back on the last time you had it in your hands and where would you put it? Ugh! That was me today. And guess what? It was sitting there right in front of me all this time, in the same little white package that my husband brought it home in couple months ago. The stack of clear stamps... While I was at it, I found a bag of Stickles that I forgot I bought from the store also a couple months ago. Moving on, here's a card I made last weekend using the Spellbinders label one nesties. Very simple and quick card. I cut the cardstock out of the Sizzix vertical card die which is kit #2 and embossed it with the snowflakes folder and stamped it with a Dandelion stamp. I glittered Maddie's clothes and used liquid pearls on the white parts of her clothes. I'm hoping to start some of my Christmas shopping this weekend but we'll see how far I actually get. Thanks for stopping by and happy Friday! Super cute card, Cheryl! Love the bling on Maddie's clothes. Aren't Jean's stamps the cutest?? so cute! 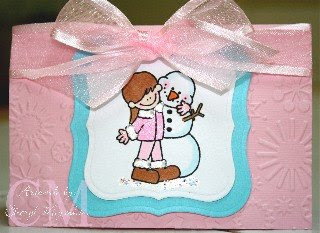 I love the colors, the bow and the cute snowman! it's really feeling like Christmas now!